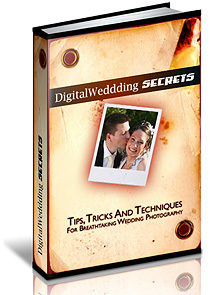 Here you'll find help and advice to ensure you have the right digital wedding photography kit. It's an honor (and possibly a curse!) to be asked to photograph someone's wedding. One of the most important things to ensure is that you are properly prepared. And that means getting your digital photography kit organized. The SAS have a saying they call the six Ps - Proper Planning and Preparation Prevents Poor Performance! And that is certainly true of the digital wedding photographer. It's the most special day for the happy couple, and you don't want to leave anything to chance. 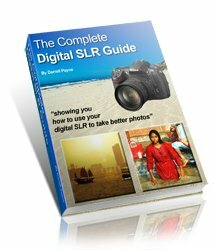 You will need a digital SLR for digital wedding photography. Don't even attempt to photograph someone's wedding with a compact camera. The main reasons are the quality of the photographs and the speed of operation. Quality is vital in digital wedding photography. Digital SLRs will produce better photographs than compacts for two reasons - they have better sensors, and they have much better lenses. Don't be fooled by simple numbers of megapixels. A 12 megapixel digital SLR will produce far, far better photographs than an 12 megapixel compact camera. This is because the sensors in digital SLRs are much bigger than those in compact cameras. And a bigger sensor means those individual pixels are not so squashed in. And that means better quality pictures. As with quality, speed is essential in digital wedding photography too. Digital SLR cameras focus fast and take photographs with virtually no shutter delay. Compact cameras don't. Many will take half a second to focus, and then when you press the shutter there's perhaps a quarter of a second delay before the photo is taken. You will miss lots of shots, and annoy everyone by having to re-take photos because you missed them the first time! Very important for digital wedding photography; without power your camera is just a lump of metal and plastic hanging around your neck! Make sure you have lots of spare power for the big day. Have two battery packs for your digital SLR camera, both fully charged. I usually take a set of Lithium batteries for my camera as well, just in case! NB: many digital SLRs come with a special 'carrier' that accepts lithium batteries. If yours didn't, you may well be able to buy one separately. Remember, you will also need power for your flashgun. Take three new sets of batteries. Check them beforehand to make sure you don't have any faulty batches. If you don't use a set, keep them safe for next time. But never run out on the day! Thinking about the small details like this is essential for the digital wedding photographer. You can easily train yourself to think more like a pro wedding photographer. Read on and I'll introduce you to a fab little toolkit that gives you everything you'll need to get your wedding photography up and running. You will definitely need a powerful flashgun. Your digital wedding photography will be lousy without one. And don't think the one attached to your camera will do. It won't. It will be underpowered and you can't diffuse the light. For quality digital wedding photography you will have to buy a flashgun that is compatible with your digital SLR camera. Sticking with own brands is best, but not really necessary. There are good third party flashguns available from manufacturers such as Metz or Sigma. Go for a guide number (that's an indication of how powerful the flash is) of at least '150ft maximum'. Your flash will need a diffuser attached and these are normally sold separately. They attach to the front of the flashgun and soften the light. Without one your flash will produce harsh shadows - not an appealing look for digital wedding photography! You can see what a diffuser looks like in the picture to the right - it's the white thing on top of the flashgun. NB: you will be using your flash all day, even in daylight! Read the digital wedding photography techniques page to find out why. Your digital SLR camera will obviously need a lens attached. For the real purists, you can't beat a prime lens. These are top quality lenses with fixed focal lengths. Most people these days have zoom lenses. These will work just fine and are far more useful. One good quality zoom lens may well be all that you need. Make sure you have a focal length of between 18-70mm as a minimum. You will need the wide angle (18mm part) for group shots, and the short telephoto (70mm part) for portraits. If the couple you are photographing want some candid shots too, then you will need a longer focal length. Go up to 200mm and you should be able to capture the cheeky smile of a bridesmaid from the back row of the church! In my own digital wedding photography I have used, very successfully, one lens all day - a Tamron 18-200mm (shown above). This covers all the most needed focal lengths for digital wedding photography in one lens. The big advantage is that you won't have to change lens at all. This is very good, because every time you change lens dust can enter the camera and cause havoc with your photographs. Best avoided! If you think you'll be switching lenses frequently (or maybe you've started taking wedding photos and find the one lens a bit restricting), consider buying two cameras. One can be fitted with a long zoom, the other with a short zoom. Between the two cameras you'll have pretty much every possible shot covered, and you'll not have to worry about fiddling with lenses. It also has the added benefit that, should one camera break down, you've got a spare to continue shooting with. For digital wedding photography you should view memory a lot like power - you don't want to run out of it on the big day! Digital SLRs store their images on memory cards. Once the card is full you either have to delete some images, or put a new card in. You want to go for the latter! The digital wedding photographer doesn't have time to go through deleting images. And might accidentally delete the wrong one! You will need lots of memory then. A 1GB card will store about 75 images from a twelve megapixel camera. This is assuming you are taking digital wedding photographs in the RAW setting (which ideally you should be doing). If you are shooting in the highest quality JPEG you camera can do you will get about 150 shots. I would recommend at least two of these cards for a standard wedding, or four if you are shooting the full day from dawn 'til midnight. Capacity is always an issue in digital wedding photography, because you will be taking lots of photographs in one day. Should you go for one 4BG card, or four 1GB cards? A larger capacity card means you won't have to change it for the whole day. But, if something goes wrong, you would loose every photograph. I always err on the side of caution and avoid putting all my eggs in one basket. My advice? Four 1GB cards is better than one 4GB card. After the wedding? Of course, protecting your images on the day os only part of the story. Once you've returned home or back to your studio you need to copy your images. Just in case something happens to those valuable memory cards! For a real belt and braces approach, which really every wedding photographer should be taking, you should also go for online storage - after all, what would happen if your computer crashed? The wedding photography toolkit is designed to make your life a lot simpler. If you are interested in accellerating your technique the good news is that the complete wedding photographers package is instantly downloadable. You could, quite literally, be honing your photography skills within minutes! And if you're concerned this might be just another gimmick, there's no need to worry because it comes with a full 60 days money back guarantee. I wouldn't recommend any product that didn't come with such a rock solid guarantee. So, if you're truly interested in taking your wedding photography a step further download the complete wedding photographers toolkit.